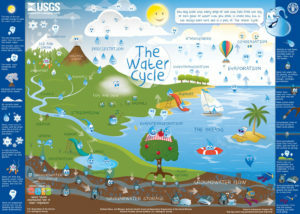 An informative, fun and interactive diagram jointly developed by The U.S. Geological Survey (USGS) and the Food and Agriculture Organization of the United Nations (FAO) outlines an easy to follow water-cycle diagram for schools. 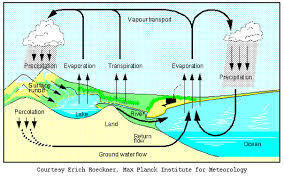 The continual movement of rainfall from the bodies of water, land, and the atmosphere is part of the hydrologic cycle. The cycle starts with condensation. When water vapor condenses in the atmosphere it forms clouds, when the condensation becomes too heavy rain is formed and the clouds release the rain. When rainfall reaches the surface it infiltrates into the soil, becoming groundwater. The infiltrated groundwater recharges our aquifers, rivers and lakes. Water that runs off the surface is referred to as stormwater. Water is returned to the atmosphere through evaporation by the sun heating the water, changing it to a gas and it rises into the atmosphere and becomes vapor again. Depending on soil conditions, the movement of stormwater across the surface can cause erosion and also carry pollutants into our bodies of water. This is why stormwater management is so important. Stormwater management practices such as infiltration, or collection, slow down the process of surface water runoff and helps keep erosion to a minimum. Much of the pollutants associated with stormwater runoff are not carried to our larger bodies of water – keeping our natural environment healthy. 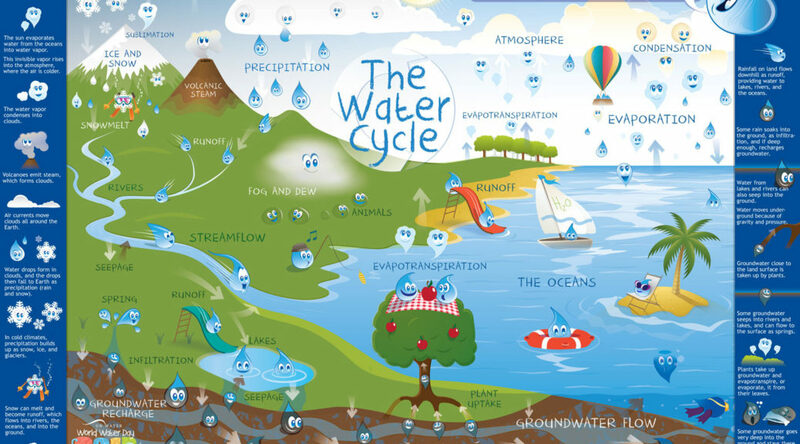 It is important to have a basic understanding of water’s lifecycle in order to fully capture the meaning of why rainwater collection is so important to having a sustainable future. Colorado needs to look no further than Seattle and Washington State for the sustainability benefits of Rainwater harvesting. The Colorado rainwater harvesting narrative shows that as time marches forward, some laws that were passed almost one hundred years ago should be reconsidered because they are just no longer practical. 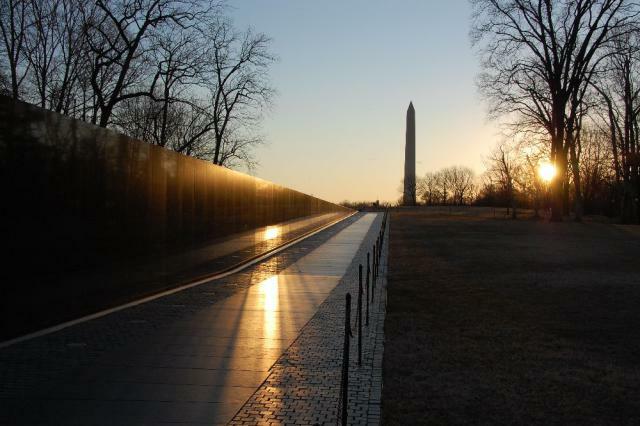 Sustainability wasn’t a factor back then, but it sure needs to be part of the equation now. In October 2009—after years of argument—the state of Washington officially declared that people could collect and store rainwater captured from a rooftop or other “guzzler” system without a water right, as long as it is used on site and essentially isn’t hurting anybody else. San Juan County was the only one that allowed rainwater collection and potable use for single family residence as an exemption to the water rights issue before the 2009 decision. Since then, King County recognized the benefits of rainwater collection in January 2011 for household usage, with support from State Department of Agriculture. So now, King County Department of Health not only allows, but encourages rainwater collection. Commercial, private, and communities all are finding benefits to rainwater collection and the positive effects on the environment of the Pacific Northwest and our water supplies. The Washington State Department of Ecology continues to support rainwater collection and studies the effects of in stream flow rates (Skagit) and salmon habitat. All Washington State counties allow for rooftop collection for non-potable use, with some allowing for potable use. Non-potable use includes irrigation, toilet facility, laundry, wash down and others that are not intended for consumption or bathing. Commercial applications are directing roof runoff to irrigation and toilet facilities, rather than having this runoff enter our bodies of water with pollutants picked up along the way. Households are not only using rainwater for non-potable use, but are having systems installed that treat and disinfect the rainwater to potable standards that are superior to city drinking water, thus conserving water by simply not allowing it to become runoff. Rural households are using rainwater collection that benefits aquifers by rainwater collection and household use, through infiltration after use. Communities are organizing communal gardening applying rainwater collection, removing the strain on small water systems, while promoting community evolvement and education. We congratulate Colorado on its progress in exploring new (to them) sustainability methods. We welcome Colorado’s steps towards better understanding of the benefits that we in Washington State currently enjoy.